So, who has ever heard of the Luxor brand? Well, I think not too many consumers, not to mention Luxor TVs. Today I will make you more familiar with this innovative brand and more specifically with one of their latest 4k LED TV sets. Overall, the TV gives moderately good picture, although the sound quality leaves a lot to be desired. The price is at around $600 or less so if you are looking to save a buck and get a decent TV, you may look into Luxor. We haven't done many Luxor TV reviews so far but the reason for that is that as a brand they haven't released any new products recently. You also have the freedom to plug in up to 3 HD devices, including a Blu-ray player, games console, set-top boxes, home cinema set-up and more. You can still use your older standard definition devices too, plugging in appliances, such as video recorders with the TV’s SCART port. This TV is also Bluetooth compatible, allowing wireless connectivity to headphones and soundbars. The LED edge lighting provides fairly good color, brightness and image clarity. The TV features a thin gloss black design that you can mount on a wall or sit on the provided plinth. You also get built-in WiFi to link into your home broadband to access on demand movies with Netflix, catch up TV with BBC iPlayer and on-tap internet access through the web browser. You can also use Twitter and Facebook and share your videos through YouTube. In today’s review, we would like to bring to your attention another budget solution for home television. Luxor offer a 50-inch screen Full HD 1920x1080 resolution and a 4K option as well. The full HD option features a built-in Freeview HD tuner so you can enjoy 12 HD channels without needing a monthly subscription package, including BBC HD, ITV HD, CBeebies HD and C4 HD. Honestly, I am quite eager to see what the Luxor brand will offer in the near future, not only on the LED TV market but in general. 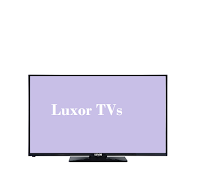 Recently I saw another of their TVs grow popularity - the 40 inch Full HD Smart TV Luxor LUX0140004/01. Hopefully there's more to come from them in the near future. Hi, June. I think in regards to reliability - Luxor TVs are OK. I didn't quite get it, are you thinking of buying 28 or 48 inch smart TV? Luxor brand is owned by turkish manufacturer Vestel. The same type of TV can you find on german market under brand Telefunken, in finnish market under Finlux and in some countries under brand Hitachi. They are not bad for the price, maybe better than chinese ones. Thanks Pjotr, that is true, it is basically the same hardware. And yes they make pretty good consumer electronics for the price. I am not quite sure about Luxor though, are they part of a bigger consortium or just a small brand?